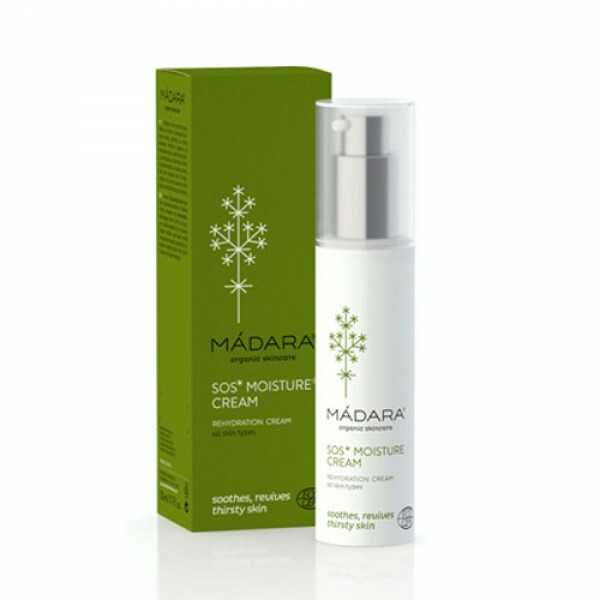 Re-hydrate thirsty skin with this new miraculous moisture cream from Madara. Packed with intensely moisturising and hydrating ingredients it's like a drink for your skin. Use alone or as an extra hydrating boost to your usual moisturiser. Intense skin rehydration treatment with moisture-boosting extracts of Northern Linseed, Cranberry, and Nettle. 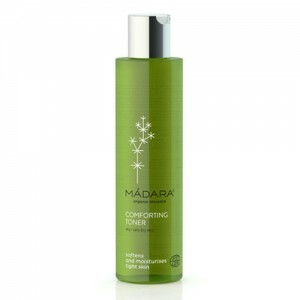 Replenishes dull, dehydrated skin, providing long-lasting moisture and nourishment. Increases vitality and keeps skin supple and protected with moisture locked-in. Aqua Simmondsia Chinensis (Jojoba) Seed Oil* Helianthus Annuus (Sunflower) Seed Oil* Alcohol Glycerin*** Caprylic/Capric Triglyceride Dicaprylyl Carbonate Glyceryl Stearate Behenyl Alcohol Theobroma Cacao (Cocoa) Seed Butter* Plantago Major (Plantain) Leaf Extract* Urtica Dioica (Nettle) Leaf Extract* Linum Usitatissimum (Flax) Seed Extract* Hippophae Rhamnoides (Sea-buckthorn) Fruit Extract* Lecithin Cetearyl Alcohol Sorbus Aucuparia (Rowan) Fruit Extract* Calendula Officinalis (Calendula) Flower Extract* Vaccinium Macrocarpon (Cranberry) Fruit Extract* Xanthan gum Stearic Acid Palmitic Acid Glycine Soja (Soybean) Sterols Sodium Hyaluronate Tocopherol Ascorbyl Palmitate Sodium Phytate Sodium Lactate Sodium PCA Mannitol Sodium Cocoyl Glutamate Lactic Acid CI 77491 (Iron Oxide)**** Aroma**. * ingredients issued from Organic Agriculture; ** natural essential oils; *** inorganic substances and/or pure mineral pigments; Natural and Organic cosmetic certified by ECOCERT SAS B.P. 47 F-32600 according to ECOCERT Standards. Apply AM and/or PM to clean skin or when skin feels thirsty.